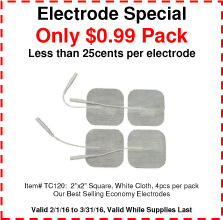 Home > Electrotherapy > Electrodes > 2"x2" Economy "Great Value/Quality" Electrodes, 4 Per Package. 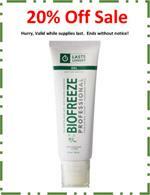 SPECIAL: 99 cents per package! Our 120 Electrode is a good quality electrode at a great price. 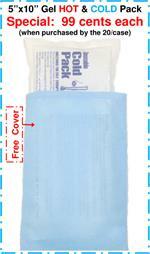 It comes packaged in a poly zip lock style bag, 4pcs per package. They have a good re-usability life and are a perfect combination of low price and good quality, which makes them a great value.